Blogger popular posts widget or most popular product (for blogger store like BlogrShop Template) can still use the standard widget functions to display larger/bigger thumbnail images. 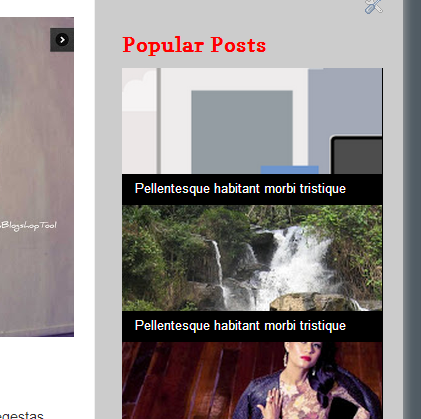 By default, the existing Blogger popular posts widget will provide you with thumbnail images size of 72px in heigth and 72px inwidth, images cropped to the respective size too. Using CSS to enlarge the popular post widget thumbnails will definitely distort the resolution, hence displaying blurred thumbnail images. In this tutorial, you will find some sweet tweaks, tutorials, tips and tricks on how to display your popular product page or most popular posts widget with larger image thumbnails size. Here is an example of the working larger size Popular Posts thumbnail images, that we have installed on our custom Blogger responsive templates by client's demand. You can also re-size your browser screen to see it in action. How to Enlarge Popular Post/Product Thumbnail Images. If you have already added in your Jquery library, you do not have to include the above line. Change to your preferred setting at the statement above. The code provided here will output a Popular Posts widget thumbnail image with a default size of 320px in width. Change to your preferred setting at the statements above. > click Save Template. Now click View Blog to preview your changes. With the styling codes above, you can also style your Popular Post thumbnail image to be responsive and look good in any screen size, just like the demo page. Now your blog or blog store will look good with bigger and sharper Popular Posts or product page images to enhance your page design layout and keep your visitors clicking the images too!